Purba Bardhaman district for Kanyashree Prakalpa, which are running under the department of Women Development and Social welfare department. 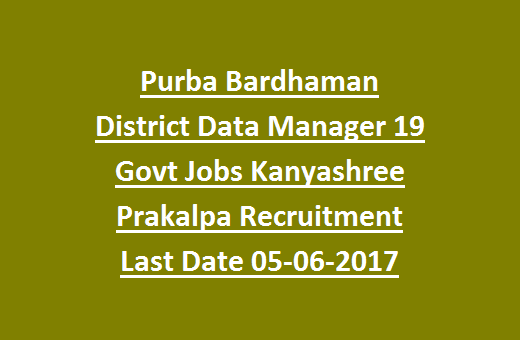 There are total 19 Data Manager Jobs in Purba Bardhaman District. Selection for this Data Manager vacancies will be held through Written Examination, Practical Exam and interview. 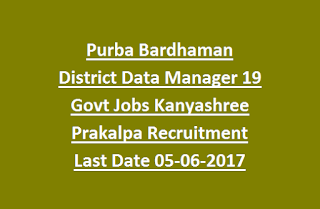 Online applications for this Purba Bardhaman District Data Manager Jobs will be received from 15-05-2017 to 05-06-2017 till 05:00 PM through official website @www.ssmbardhaman.org. For more information about this Kanyashree Prakalpa Data Manager jobs of Bardhaman district see the below given information. Upper age limit for general candidates is 18-37 years as on 01-04-2017. For retired employees upper age limit is 65 Years. Candidates should have completed Graduation and Computer Knowledge Certificate. Must have skills in Typing with the speed of 30 WPM in Keyboard. Written exam will be held for 90 Marks. Total 90 objective type multiple choice questions will be given. Typing speed should be 30 wpm. Candidate can submit their application through the website of www.ssmbardhaman.org from 15-05-2017 to 05-06-2017 till 05:00 PM. After submission of application form online send application printed copy along with required documents to Office of the District Megistrate & Collector, District Project Management Unit, Kanyashree Prakalpa, New Administrative Building, 3rd Floor, Purba Bardhaman-713101 on or before 06-06-2017 before 05:00 PM. 5. For retired employees proof of employment, tenure and superannuation from the employer.